There is something cheesy going on in the kingdom of Great Kerfuffle! The rascally BADgers have escaped from jail again and they made an amazing discovery--a pizza mine! They love eating it, of course, and selling it to make money to fund their villainous plots. But there's a big problem: the Loose Pebbles library is tipping over without all that pizza to hold it up. And if it tips any farther, the entire island of Great Kerfuffle will flip over into the ocean! 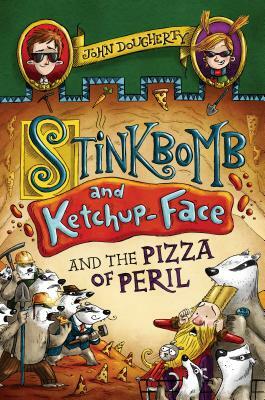 So it's up to Stinkbomb and Ketchup-Face to save the day. But even with a shopping cart disguised as a horse, secret agent sunglasses, and an elephant who walks by at just the right moment, a surprise that's bigger and badder than ever throws them for a loop. Will the island of Great Kerfuffle be no more? We can't tell you, because that would spoil the story! John Dougherty was born in Larne, Northern Ireland. He studied psychology at university and then tried his hand at a number of jobs including YMCA hostel worker, factory machine operator, and unsuccessful singer-songwriter, before becoming a primary school teacher. His books have been shortlisted for a number of prestigious awards - and one was chosen by The London Times as one of the Best Children's Books of the Year 2011 - but, more importantly, they make children giggle.